Odds are, if you’ve been around watches for awhile, and have paid attention to how they’re illuminated, you’ve come across a product called tritium (if you’re not familiar with, you can read up on it here). With not having to be “charged” by sunlight, it’s a very attractive, never-dimming (for the first 10 years) lighting source for a watch. Today, we’re going to take a look at a less-well known brand in the tritium-lit genre, courtesy of the folks at Tactical Watch Technology. The specific model that they sent over is the AmourLite ColorBurst Blue, which, as you can guess, features blue as it’s accent colors (there are other options as well, such as green and white). First off, we’ve got the blue tritium tubes, found on the dial and the hour and minute hands. While some lumed watches radiate gobs of light, the blue tritium here is much more subtle – yet it’s still very readable. 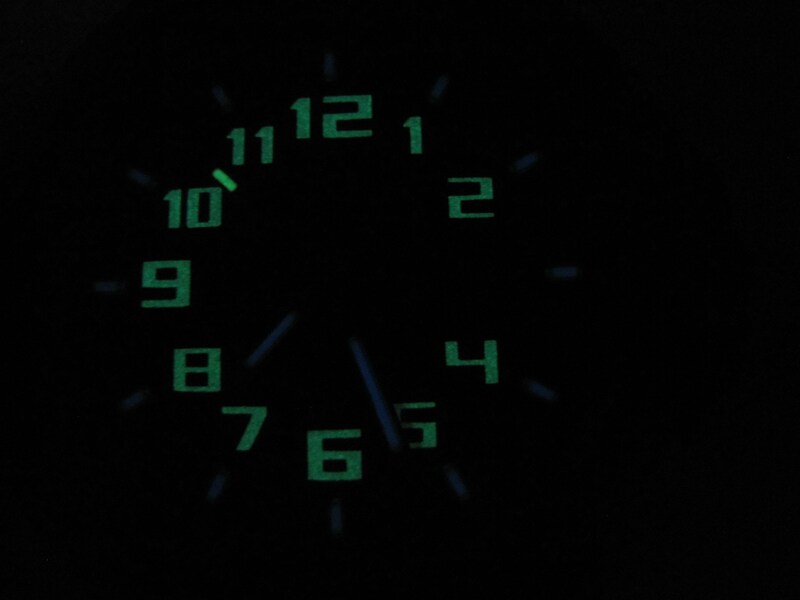 The tritium itself makes this watch an absolute snap to read in the dark (you may want to click on the lume pic above to see it zoomed in). The addition of the raised (and lumed) number markers (blue, in this case) on the dial, as well as on the seconds hand, just adds another level of readability. As long as we’re talking colors, let’s discuss the other two found here – black and white. 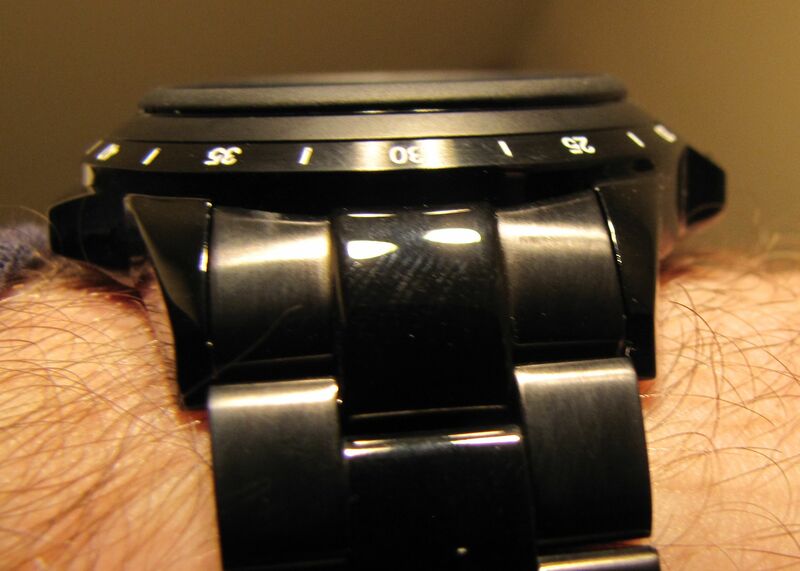 Obviously, the 46mm case (and 22mm deployant clasp bracelet) are black. What you may not notice is that you’ve actually got alternating glossy and matte finishes. Just another small detail I enjoyed with the watch. Finally, you’ve got white. This is found on the indices on the dial, the numbers on the (fixed) bezel, and the date display window. And here is the one nit-pick I’ve got with the watch. With the dial itself being black, I think it would look a lot cleaner to have the date be white numerals on black, rather than the black on white that we have here. 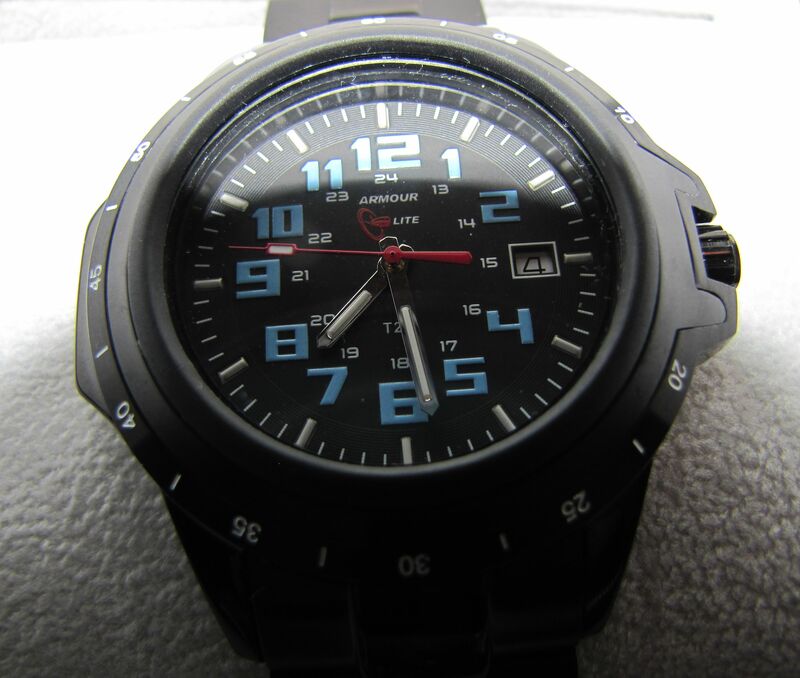 While the watch has an MSRP approaching $400, Tactical Watch Technology currently has it on sale for $300. To my eyes, if you’re looking for a tritium watch, this should definitely be on your short list for consideration. Our thanks, once again, to Tactical Watch for providing the review sample. Awesome looking watch. I like the combo of two illumination systems – the tritium markers and the 3D luminescent numbers. How does it look after the numbers have dimmed? It’s a very soft blue glow.